The first stars are born (Population III). They are large, massive, bright and short-lived. They only contain hydrogen, helium and some lithium. Other heavier elements are born in the fusion reactions inside the stars. Depending on their mass, they explode as supernovae or hypernovae. The first stars are born (Population III). We do not know exactly when the first stars formed, because there have been no observations of these stars. They are large, massive, bright and short-lived. They consist of only hydrogen, helium and lithium. Other elements are formed in fusion reactions inside the stars, and in the supernova or hypernova-explosions when they die. Explosion of a large star spreads its contents into space, for the next stars to form from. Small stars might have also formed already in the young Universe, and these could still be around us among younger stars. Our closest star is the Sun. Fusion reactions occur inside of stars. The star is in hydrostatic equilibrium, so that the pressure from the radiation coming from the centre is equal to the gravity pulling it together. If this balance is upset, the star can pulsate, collapse or explode. Fusion is the process, where atoms are combined into heavier atoms. This also releases energy. Inside a star this means, normally, combining four hydrogen atoms into one helium atom. Carbon is created when three helium atoms collide with each other. Even though this is not the process of burning, it is normally referred as the process of ’burning’ hydrogen into helium. What is a stellar population? In astronomy, stars are classified into populations. Most of the stars are members of population I or II. Walter Baade named these groups in research published in 1944, where he compared the stars in open or globular clusters. Later it was shown that population I stars were young and metal rich and population II stars were older and more metal poor. It is good to note that in astronomy all elements heavier than helium are colloquially called as ’metals’. Nowadays the population classification is also used as to denote the age of a star. The oldest, first population, is referred to as population III. As a star ages it runs out of hydrogen. This does not mean that the life of a star ends abruptly. 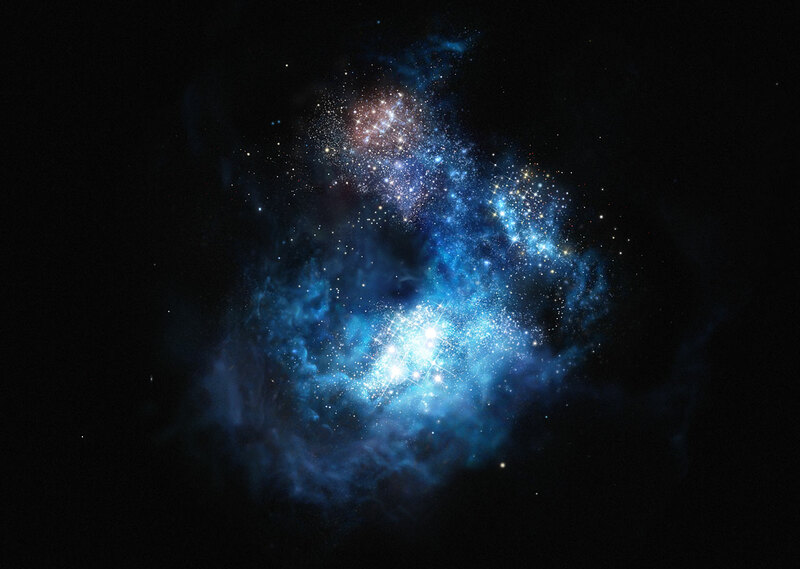 Stars continue to ’burn’ other elements, such as helium, carbon and oxygen – i.e. to fuse then into heavier nuclei. When the centre of a star has become iron, it cannot form any heavier elements. This means that the pressure from the radiation, keeping the star from collapsing, ceases. The star collapses, causing a violent outburst, called a supernova. For a moment a star can shine brighter than all other stars in a galaxy combined together. A superluminous supernova (SLSN) is a supernova, where the mass of the star is over one hundred times the mass of the Sun. Small, sun-like stars, don’t explode as large supernovae, but shrink down into white dwarfs, and eventually into black dwarfs.